Feast. Raw fish. Quail with mash, with berries of some sort? Hands down, the most interesting aspect of Rustic Canyon was the mysterious berries. They were softer than pomegranate seeds, smaller than blueberries, but had the zing and color of a mini-maraschino cherry. The dish was, in my eyes, “natural,” implementing clever use of contrasting textures and colors without the use of modern gastronomy techniques. All real food on real plates in a real restaurant. Crispy, tender meat, popping gaps of sweetness, and smooth, buttery mash. Pretty solid food KO. The explosive surprise of the wonderful beads of fruit reminded me of an Iron Chef episode that unveiled the formation of a “ball of vinaigrette” through the use of sodium alginate. Texture and contrast are two important factors in the enjoyment of a proper meal, so the successful implementation of such a technique can certainly bring life to a dish. In terms of texture, it would be interesting to find a contrasting pocket of flavor that explodes in your mouth. If we imagine a normal salad with a regular vinaigrette, we naturally picture a dispersed vinaigrette delicately clinging onto the leaves. What happens if, instead, there were gelatinized balls of vinaigrette interspersed throughout the delicate leaves; how would the ultimate experience change with mini-edible “sauce” packets strewn about? (the NEXT big thing?). Would the classification of the meal still be a salad? 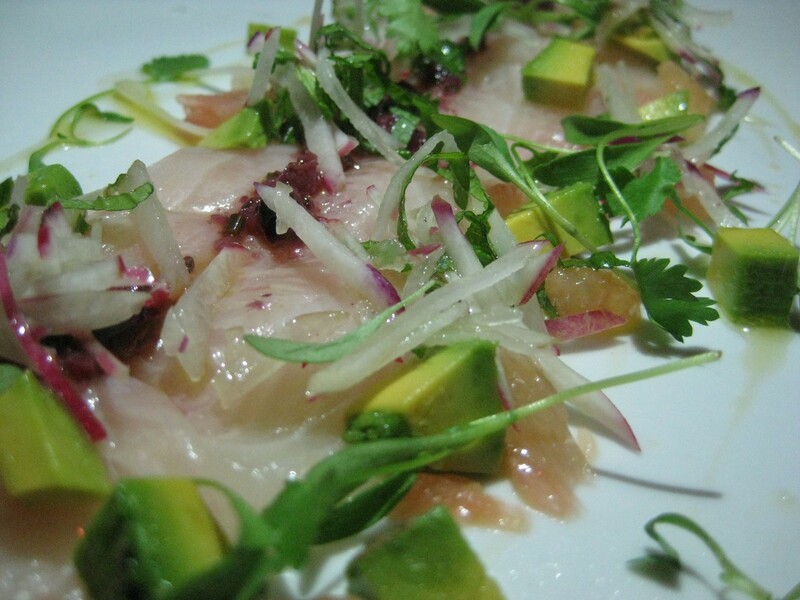 A crudo application trying so hard to pass as a salad. 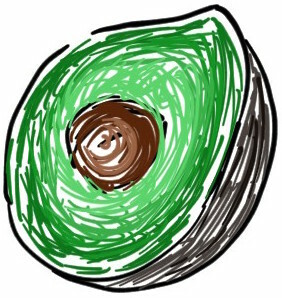 So, following off of that mental experiment…the above (balls of whatever) is certainly possible. How does one go about making…these balls of flavor? This kind of posh-delivery system can be achieved through the use of sodium alginate. Alginate at its very core, is simply a thickener, a substance that reacts with calcium to form tangled networks. Thus, when sodium alginate is used in a bath of calcium, one can achieve spherification or reverse spherification of certain liquids. Spherification, in this case, refers to a solution of sodium alginate (solution being, a juice/flavorful liquid mixed with alginate) being dripped into a bath of the calcium-infused liquid. 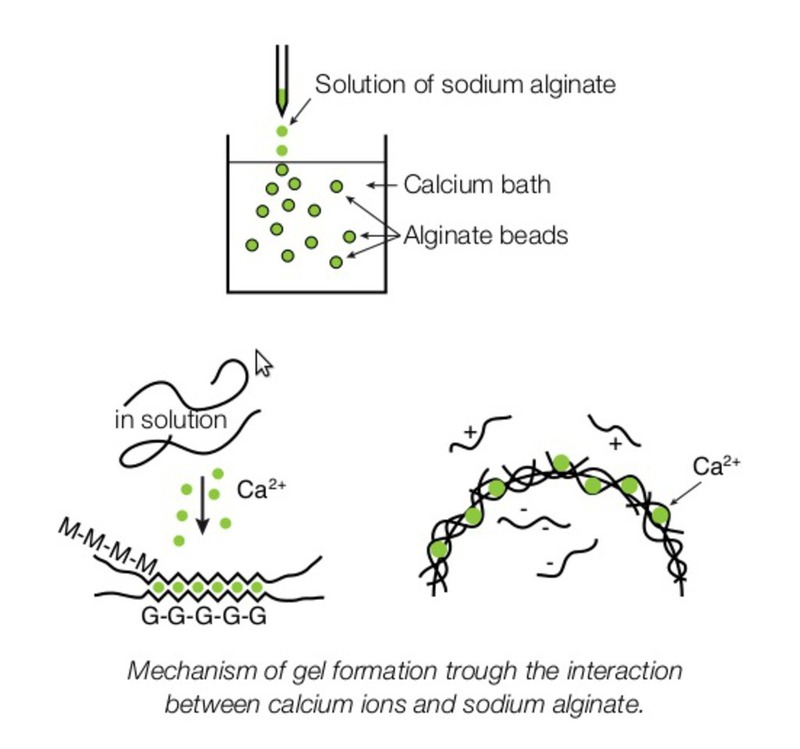 The drop, upon hitting the surface of the calcium bath, will react with calcium, and create a network of tangled carbohydrate strands, which subsequently forms a gel. Since this happens almost instantaneously, the spherical shape of the drop will not have time to disperse, and thus, would gel together, creating (insert flavor)-flavored caviar. Reverse spherification is the implementation where sodium alginate is the bath itself, and the liquid to be spherified is mixed with calcium and spooned in (the liquid must be relatively thick). Reverse spherification is better at creating spheres with liquid interiors, as the calcium content is technically “finite.” (Some calcium spooned into a sea of alginate) Removal of the spheres from the alginate bath will stop the gelling reaction, leaving the interior in a liquid phase. This will hopefully become more lucid as the mechanism for sodium alginate is revealed. But yes, you have a question. Can’t reverse spherification be used for creating caviar, like in spherification? Not really. For small caviar-sized drops, the sodium alginate bath is too dense to be penetrated by single drops. They would just hit the surface and sit there or…create some nicely deformed drops. Summary? Spherification, alginate solution into calcium bath, creates small-gelled caviar. Reverse spherification, thick-calcium solution spooned into alginate bath, creates larger spheres with a liquid interior. Or, the next time you see this type of application, just yell MOLECULAR GASTRONOMY!”. (Actually don’t, you’ll probably get kicked out of the restaurant). The mechanism for all this nonsense, quick and dirty. Alginate is a polymer that is extracted from seaweed, and is made of two types of carbohydrates, which are usually denoted as carbohydrate M and carbohydrate G. When calcium ions are introduced to these G or M residues, they wrap around the calcium ion, and entanglement occurs. The creation of caviar-spheres is below, courtesy of Cuisine Innovation France. An excellent portrayal of spherification. Entanglement usually entails the formation of a network and network, means gel. Since the liquid is introduced in a spherical shape, the resulting gel is spherical. This kind of stuff should replace Play-Doh for idle-time play.